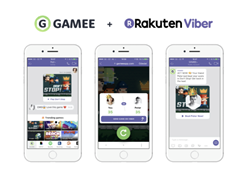 GAMEE aligns with Rakuten Viber to introduce its first gaming Chat Extension directly playable within Viber's chat environment. Today, GAMEE a platform dedicated to transforming games into easily embeddable and shareable across social environments, announces its partnership with Rakuten Viber. Through this alignment, GAMEE will launch its first gaming Chat Extension with over 70 games directly playable within Viber’s chat environment. As a pioneer in the mobile gaming space, GAMEE was designed to enable and encourage gamers from around the world to partake in small, immediate doses. With over 2 billion game plays, GAMEE’s approach to social gaming across platforms has struck a chord with mobile users. By allowing their games to be accessed across a variety of social environments, not just a proprietary app, GAMEE manages to deliver unobtrusive gaming options that allow players to participate and compete within the mobile environments where they already spend much of their time. GAMEE’s Chat Extension allows Viber users to incorporate GAMEE games directly into their in-app conversations and engagements with friends, expanding the reach of these games to even more users globally. Early results since launch have been quite strong and suggest an appetite for this experience. Viber users are accessing the GAMEE Chat Extension an average of 34 gameplays per day, which is 30% higher than on other platforms, and are spending about 20 minutes of playtime daily. “We are thrilled to bring our chat extensions to Viber’s platform. As one of the biggest messaging apps with 1 billion users, we are confident that this new alignment will make our gaming experience even more accessible to gamers of all levels across the globe,” says GAMEE CEO Bozena Rezab. “We’re so excited to work with Gamee to bring their social gaming to Viber’s audience,” Cristina Constandache, VP Global Partnerships at Viber said. “We wanted to offer Viber users around the world something that truly enhances their experience and easily engages them to chat about, share and play games together." The Chat Extension is a direct answer to the decline in-app downloads among smartphone owners across the globe. According to a ComScore MobiLens report published in May of 2017, a majority share of mobile users do not download any new apps over the course of a month. However, mobile owners are spending more time in the apps they already run on their devices. By partnering with one of the most popular messaging apps on the market, GAMEE is able to deliver a solution that works with users shifting mobile behaviors. GAMEE joins the ranks of YouTube, Spotify, and GIPHY, as one of the early wave chat extension options on Viber’s growing platform.